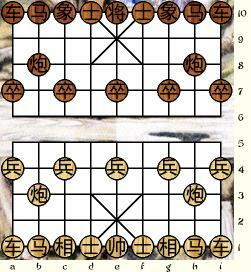 These presets are for playing the Chinese form of Chess, known as Xiángqí, on Game Courier, our online play-by-mail system. Each preset will enforce the rules and spot check, checkmate, and stalemate. 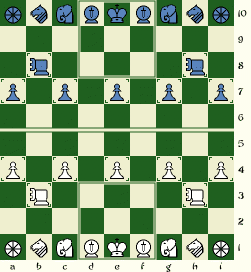 They recognize normal illegal moves, such as a piece moving as it can't or a player moving into check. But they will not enforce the rule against repeated checks. That is up to the players to abide by. If you find any bugs, please report them to Fergus Duniho. The presets here come in a selection of board/piece combinations, and users are free to choose any other board/piece combination after they begin playing. Here are CSS versions and 80% reduced JPG or PNG versions of each preset. 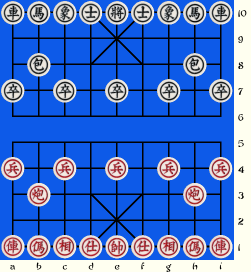 Chinese Chess now supports the ability to display legal moves when you click on a piece. For the GB and Big5 images, Why do the red pieces look white? I have added some new customizations using the Alfaerie pieces with boards better suited for them. 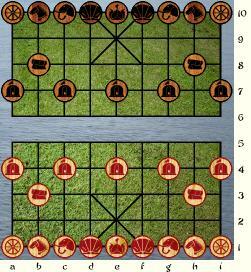 I have also changed the board for the Eurasian pieces to one based on the Eurasian Chess board. Standard Alfaerie pieces are not suitable for the Chinese Chess board. If someone cared to make disc pieces with Alfaerie images, then those could be used for Chinese Chess. Would be nice to have Alfaerie Graphics for this preset. 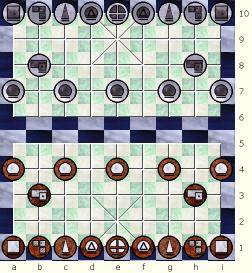 This is my favorite graphics and I always select it when playing other chess variants here.